Learn how to use NVDIMM-N and PCIe based non volatile memory solutions to accelerate your applications to a new level. Empowering technology to drive your business – the Netlist Advantage! We demonstrate the actual work difference between Industry leading PCIe NVMe NAND device and Netlist NV4 NVDIMM-N using a Sysbench write intensive OLTP workload. The Sysbench tool is used to update, insert, and delete database records from 32 different tables consisting of 10 million records each. Each update/insert/delete sequence is considered a transaction. 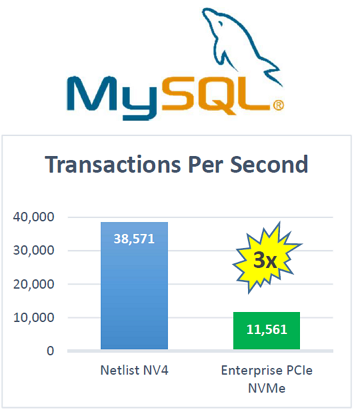 The key metric is the number of database transactions committed per second. 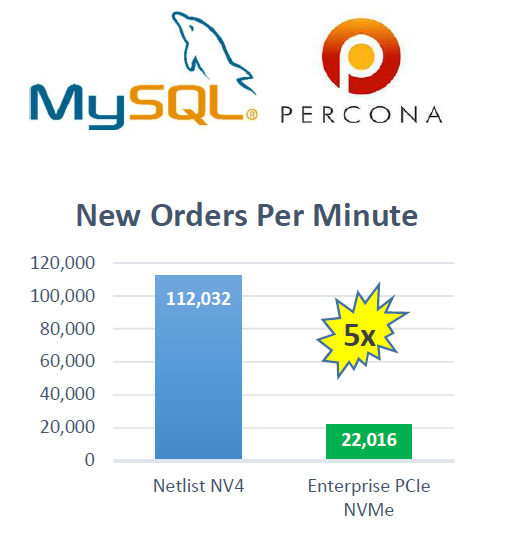 We compare two test cases: one with the entire database on Netlist NV4 and one with the entire database on the leading PCIe NVMe competitor. The NV4 achieved a transaction rate over 3x higher than the Best in Class Enterprise PCIe NVMe solution. We demonstrate the actual work difference between Industry leading PCIe NVME NAND device and Netlist NV4 NVDIMM-N using a PerconaTM TPC-C like workload. The PerconaTM tool is an abstract version of a complex enterprise that sells items and all of the related warehouse management transactions that are required to manage stock in the database, 800 warehouses in this example. The key metric is the number of New Orders per minute that can be fulfilled. We compare two test cases: one with the entire database on Netlist NV4 and one with the entire database on the leading PCIe NVMe competitor. The NV4 achieved a transaction rate 5x higher than the Best in Class Enterprise PCIe NVMe solution. We demonstrate the actual work difference between Industry leading PCIe NVME NAND device and Netlist NV4 NVDIMM-N using a Key-Value Store implemented with Yahoo Cloud Serving Benchmark (YCSB). YCSB is a benchmarking framework and common set of workloads for evaluating the performance of different Key-Value and “cloud” serving stores. We use YCSB Workload A, which is 50% read, 50% update. The Key-Value store contains 50 million 1K records. We compare two test cases: one with the entire database on Netlist NV4 and one with the entire database on the leading PCIe NVMe competitor. The NV4 achieved a transaction rate 2x higher than the Best in Class Enterprise PCIe NVMe solution. We demonstrate the actual work difference between Industry leading PCIe NVMe NAND device and Netlist NV4 NVDIMM-N using a TPC-H Like read-intensive Decision Support System (DSS) Workload. HammerDB is used to execute 22 different DSS-type queries on a TPC-H like database schema. 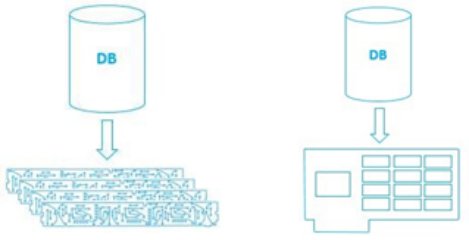 Each query is a different combination of complex join, sort, limit, and range operations. The key metric is the time it takes to complete all 22 queries, shorter is better. We compare two test cases: one with the entire database on Netlist NV4 and one with the entire database on the leading PCIe NVMe competitor. The NV4 completed the query list 4x faster than the Best in Class Enterprise PCIe NVMe solution. We demonstrate the actual work difference between Industry leading PCIe NVMe NAND device and Netlist NV4 NVDIMM-N using YCSB Workload A on a MongoDB Document Collection. YCSB Workload A consists of 50% read operations and 50% update operations. The read and update operations are being executed against a MongoDB collection containing 50 million documents. 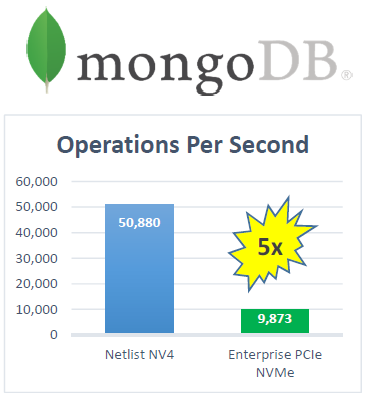 The key metric is the number of database operations performed per second. 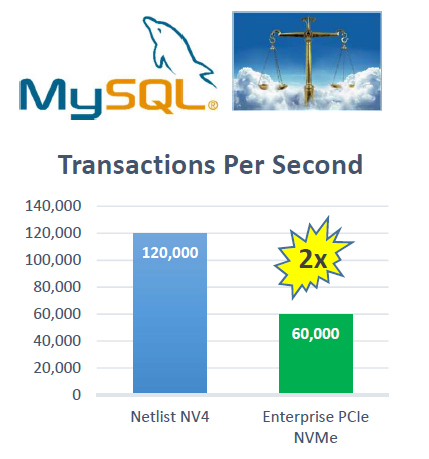 We compare two test cases: one with the entire database on Netlist NV4 and one with the entire database on the leading PCIe NVMe competitor. The NV4 achieved an operation rate over 5x higher than the Best in Class Enterprise PCIe NVMe solution. 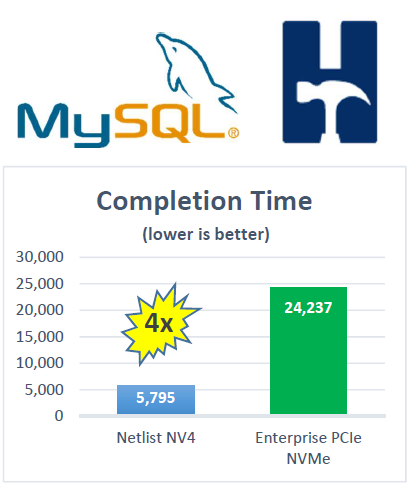 Here, we demonstrate the performance advantage achieved by using Netlist NV4 as a Ceph journal. Using the Ceph Benchmarking Tool (CBT), we exercise a 128GB RBD volume using fio with librbd. The test was run on a Ceph cluster consisting of 4 OSD nodes containing 8 OSDs each, for a cluster total of 32 OSDs. 2 client servers were used to exercise the RBD volume. For this test, we compare two cases. One is the Ceph default, which is keeping the journal on the OSD device. The other case is putting the Ceph journal on Netlist NV4. 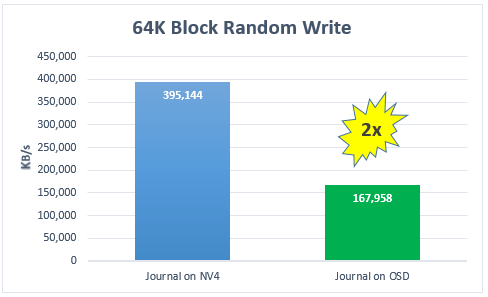 When NV4 is used as the journal, we demonstrate a 2x improvement in write bandwidth at a variety of block sizes, including 64K block random writes (as shown). Standardized testing was performed against four distinct configurations. All tests were performed on the same system with identical testing parameters except for the differences noted below.